MASON, Ohio, Aug. 16, 2018 /PRNewswire/ — Kings Island’s most beloved attraction, the antique cars ride, is returning to the park in spring 2019. In the new Kings Mills Antique Autos family ride, guests will board replica classic touring cars and take a leisurely drive around a scenic track equipped with a small rail to keep the car on the path. 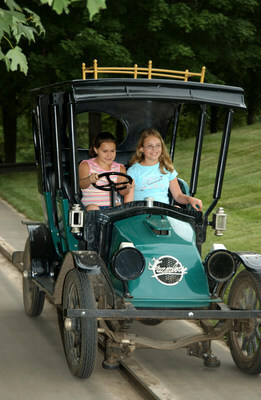 The ride will be comparable to the original Les Taxis antique car ride, combining nostalgia with new enhancements. Today’s announcement comes exactly 14 years after the park closed the popular ride. Kings Mills Antique Autos will be located in Coney Mall, across from the Juke Box Café and alongside The Racer roller coaster. The ride will be a quarter mile in length and last approximately three minutes. The cars are 2/3 scale replicas of the 1911 Ford Model T; though all-new, they will retain the vintage feel of the original Les Taxis. The ride’s name, as well as theming throughout the attraction, is expected to enhance the nostalgic experience for riders. The announcement coincides with fan favorite National Roller Coaster Day, celebrated each year on August 16. Kings Island is one of the best places in the world to celebrate the day, as guests can experience the park’s 16 roller coasters including the world’s longest wooden (The Beast) and steel inverted (Banshee) roller coasters, plus award winners Diamondback and Mystic Timbers. To celebrate, the park has a special 2019 Gold Pass offer only valid through this Sunday, August 19. Guests who purchase a Gold Pass, or renew their 2018 Gold Pass, will receive a Fast Lane Plus ticket to use select dates through October. And new for this year, passholders will enjoy unlimited visits to Kings Island for the rest of 2018 season in addition to all of 2019. Details and all Gold Pass benefits are available on the park’s website, www.visitkingsisland.com. With more than 100 rides, shows and attractions, Kings Island offers the perfect combination of world-class thrills and family attractions. Guests can experience 16 roller coasters, including Mystic Timbers, voted “Best New Ride” in 2017 by Amusement Today; a 17-time, award-winning kids’ area and 33-acre water park. For more information, go to visitkingsisland.com. Kings Island is owned and operated by Cedar Fair Entertainment Company (NYSE: FUN), a publicly traded partnership and one of the largest regional amusement-resort operators in the world. The Company owns and operates 11 amusement parks, two outdoor water parks, one indoor water park and four hotels. For more information, see www.cedarfair.com.